Big hat tip to Law of Bliss for the original recipe. We were so inspired and I highly recommend you check out their blog. 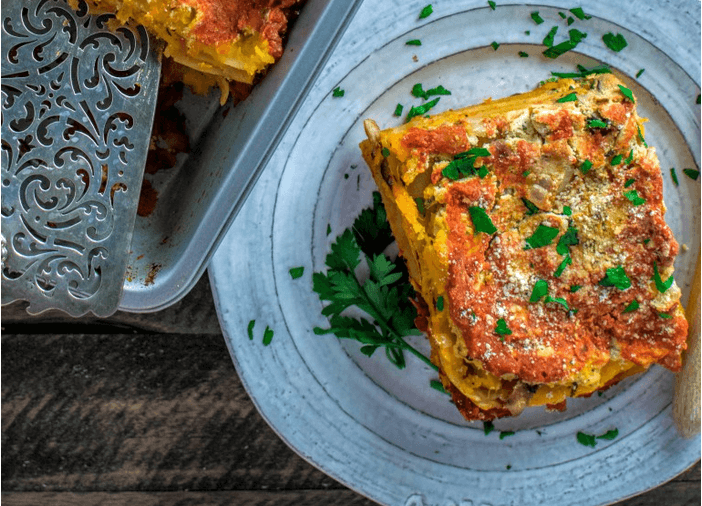 With just a couple of tweaks we think this vegan lasagna is just perfection. If you are ready to impress with some incredible lasagna then let’s get to it. You will be making some marinara, vegan ricotta, mashed butternut squash, sauteed mushrooms, and noodles. If you are ready to get going, let’s do it. To make the tofu ricotta: crumble the pressed tofu into large chunks and put in a food processor. Add the remaining ingredients and blend until you have a creamy texture like ricotta cheese. Taste for salt, acidity, and cheesiness, adding more salt, lemon juice, or nutritional yeast, respectively, as needed. To assemble the lasagna: Lightly oil the bottom of a 13×9 baking pan. Pour about 1 cup of marinara sauce onto the bottom of the pan. Top with 4 no-boil lasagna noodles. 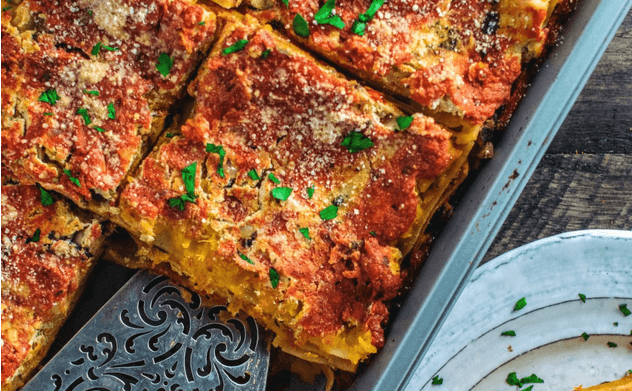 Spread noodles with butternut squash mash, top with mushroom and onion mixture, scatter a few crispy sage leaves, add a layer of tofu ricotta and spread it out, and finally top with a layer of marinara sauce. Repeat the layers, ending with marinara sauce. Cover pan with aluminum foil and bake for 20 minutes. Uncover the pan and top with 2 additional tablespoons of vegan parmesan cheese, if desired. Bake uncovered for an additional 20 minutes. Top with fresh basil or parsley leaves. Thanks again for the recipe inspiration from Law Of Bliss. Check out their blog for more amazing vegan recipes.